Van Vihar Wildlife Sanctuary is located in Indian state of Rajasthan. The sanctuary is in Dholpur district of the state and lies in Vindhyan Plateau. The sanctuary comprises the Van Vihar and Ramsagar wildlife reserves and spans over about 53 km. Various species of animals and birds can be found in the Sanctuary. Many tourists visit the sanctuary during the peak period. Some exotic species of animals and birds can also be seen here. The sanctuary is rich in flora with various species of plants found there. The sanctuary houses plenty of Dhoke and Khair trees interspersed with other trees and meadows. Van Vihar wild life sanctuary is home to many species of animals like sambhar, chital, sloth bear, wild boar, blue bull, leopard and hyena. Ramsagar part of the sanctuary has a lake situated in it. The lake houses many crocodiles and varieties of fishes. Moorhen, white-breasted water hen, Jakanas, River tern, Ringed plover, herons and sand piper can also be spotted here. Temperature of the region varies from 33 to 45 degree Celsius in summer while it is from 8 to 23 degree Celsius in winter. 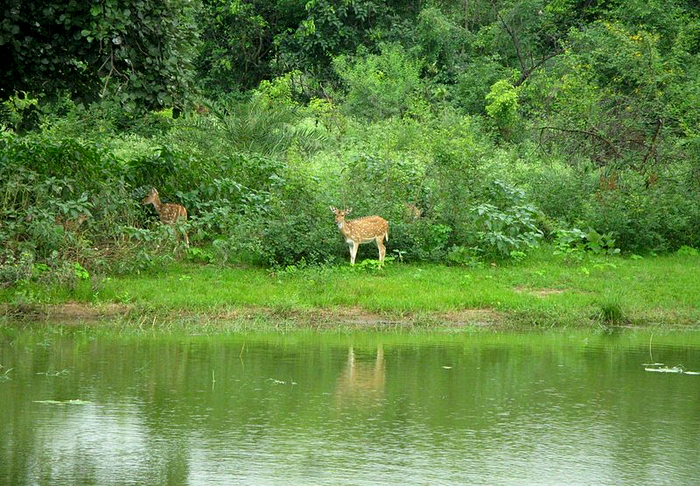 October to February is the best time to visit the Van Vihar Wildlife Sanctuary. Dholpur is just 18 km away from the sanctuary. There are many state run buses that connect Dholpur to Van Vihar Sanctuary. Dholpur further is well linked by rail and road to other parts of the state and the country. Dholpur Railway station is connected to Rajkot, Jaipur, Delhi, Mumbai and many other cities and towns of the state and the country.